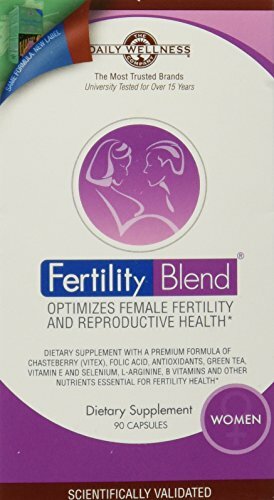 Fertility Blend for Women helps improve fertility health by optimizing hormonal and menstrual cycle balance. Vitex agnus-castus (chasteberry herb) enhances hormone balance and ovulation. The antioxidants green tea, vitamin E and selenium improve overall reproductive health. L-arginine is an amino acid that stimulates the reproductive organs by improving circulation. Vitamins B6 and B12, folic acid, iron, magnesium, and zinc help address specific deficiencies that are known to impact fertility health.